I've started receiving the first emails about Team USA from USA Triathlon. I keep saying I'm going, I have my sponsor plan outlined, but I haven't pulled the proverbial trigger. Today I took that giant first step off the cliff. The hotel room is booked and on the credit card (prepaid, ouch...) so at least it's easier to come up with the budget now too. I'll be sharing details of the Team USA journey here, but not in any sort of "hey, I'm all that" way. Just to be straight, I have no delusions of grandeur here. 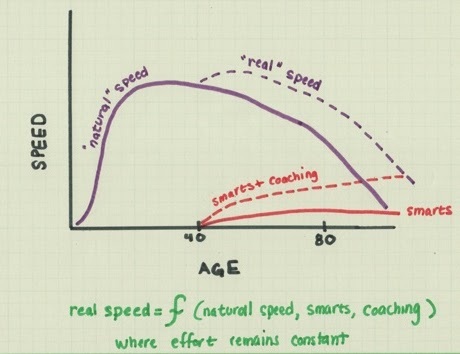 There are plenty (PLENTY) of faster, better, smarter athletes just in my age group but the numbers worked in my favor at Nationals and I earned a spot. I want to share because I'm guessing there are other folks who might like to try this and like me are (1) cash strapped and (2) not at all a seasoned international traveler. I am figuring out how to finance it and how to travel half-way around the world with my bike. Fortunately, I have a great group of friends from Roanoke, the next town up, who have made a habit of competing at ITU Worlds. 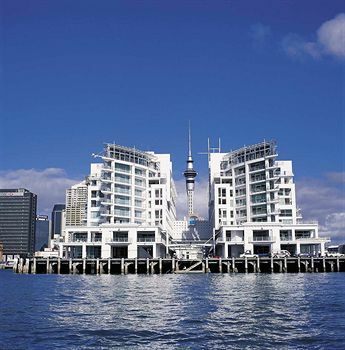 Mike Morris, one of the veterans, got the ball rolling by finding a nice early-booking deal at this Hilton on the water in Auckland. Team USA offers hotel packages too but for several logistical and budget issues, this made more sense. My only real international travel thus far includes a few family trips to Costa Rica when my father-in-law lived there, Guadeloupe when I was a kid, St. Lucia for our honeymoon, and Vancouver. (OK, so maybe Canada isn't exactly international!) 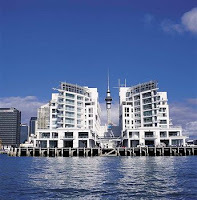 At least I won't have language issues in Auckland. 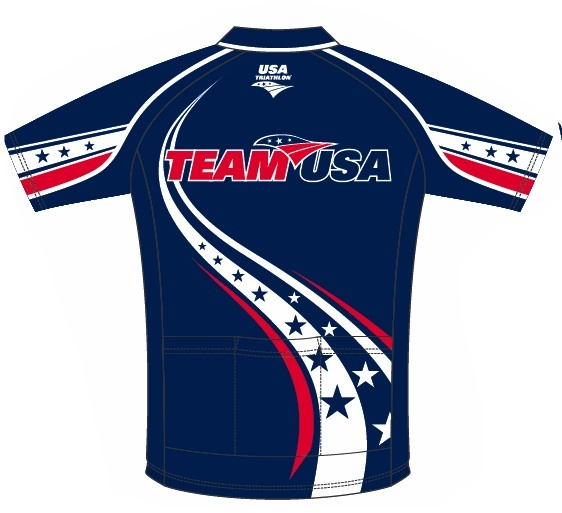 The other thing was I had the opportunity to order a Team USA cycling jersey. I'll admit I thought about it, briefly, but then figured (1) I really don't need to be wearing anything that gives the false impression that I am anything other than just a decent cyclist and (2) That $90 is better off in my account. 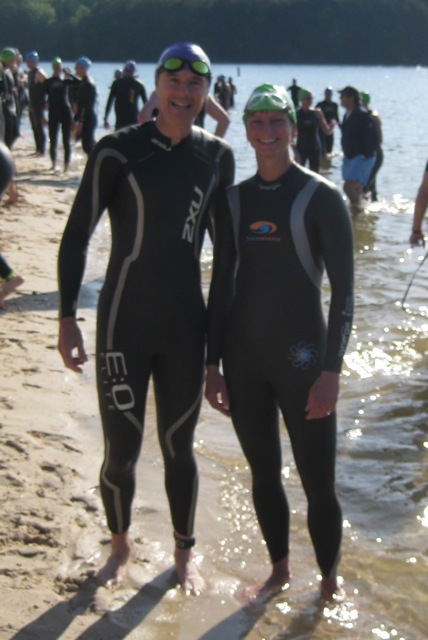 Kurt and I met last week and he came up with a new off-season strength training plan to target my goals of speed and power. Today was day ONE. Let's just say it was rather humbling and nausea-inducing. But I like that, it means lots of room for improvement and plenty to do! 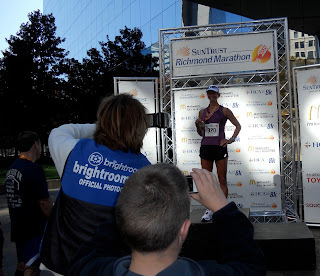 I got some race photos from Richmond. They show me in various states of decline! 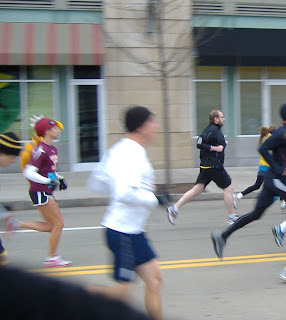 I love how strong and confident I am in the one on the left, and on the right it's the classic marathon shuffle. That body language says it all...let me be DONE! Enjoy the holiday week everyone!! 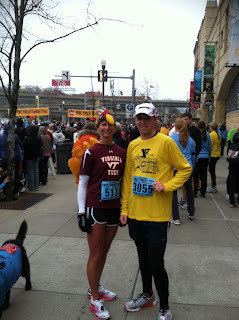 I'm planning to bust out my fourth Pittsburgh Turkey Trot with my nephew, Evan. 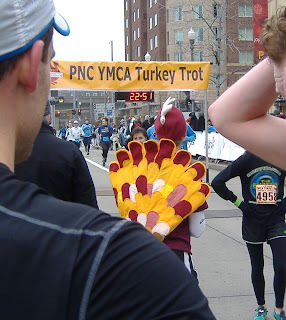 After a cold, rainy one last year, I'm looking forward to being back out there in my turkey costume. Gobble, gobble! What's a girl do when all the obsessing is done? When there is no need to debate exactly how many gels to carry in the race or to worry whether a muscle suddenly feels funny? When "workouts" are things like a 5 mile recovery spin and a 30 minute walk? 1. 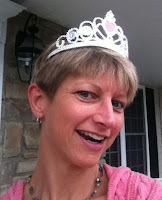 Join local online group of "Running Princesses" and take photo to prove, by virtue of owning a tiara, that you indeed belong. 2. Print out the map and elevation chart for Boston Marathon and hang on refrigerator and in office. Start dreaming and planning for April 16, 2012. 3. Wonder if this oddly simple "100-Up" workout really does make a person faster (see page 5 of The Once and Future Way to Run, Christopher MacDougall, NYT). What if I multi-tasked and did it while brushing my teeth? 4. 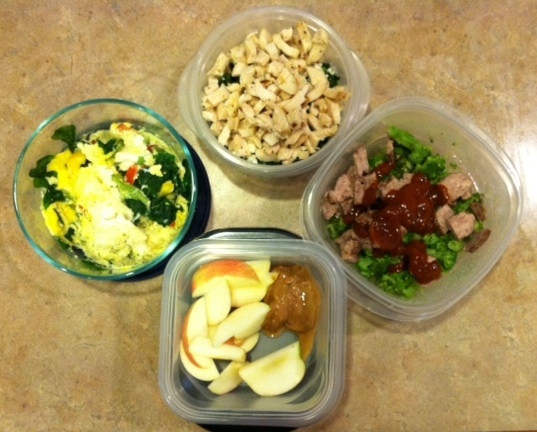 Turn recovery walk into a power hike. (I'm a bit guilty of the "give an inch, take a mile" thing). elevation chart of my "recovery walk"
5. 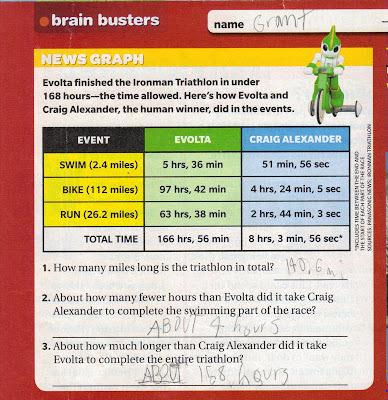 Share bounty of "helpful" ideas with Coach like 100-Up (see #3) and incorporating power hike (see #4) on a regular basis. 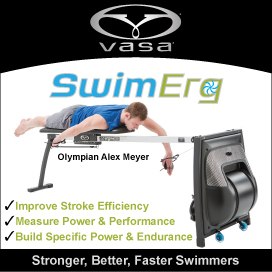 Does he think that flapping my arms while cooking dinner would help me swim faster? If so, I am willing to do it! 6. Tell Kurt you are ready to identify some strength training goals and kick it into a higher gear. 7. Take work productivity to new levels. 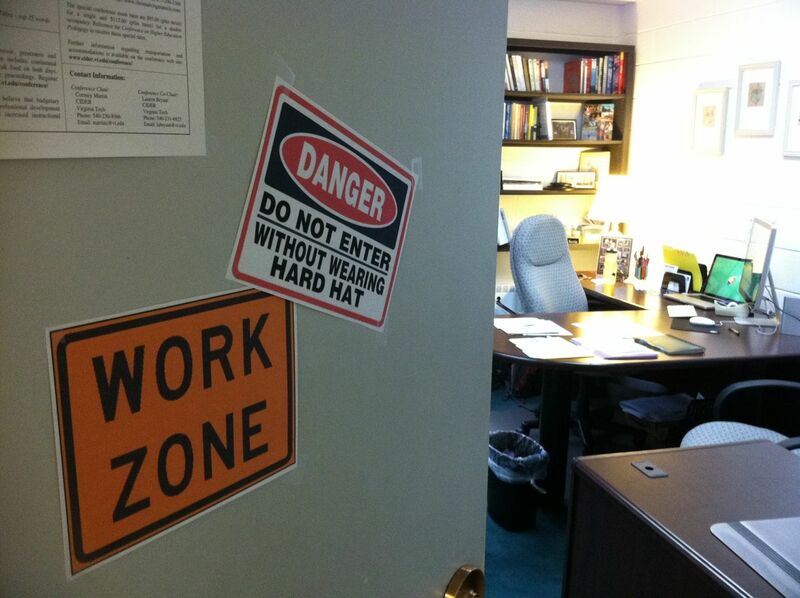 Put signs on door to indicate such. 8. Catch up on life and start thinking about the holidays!! 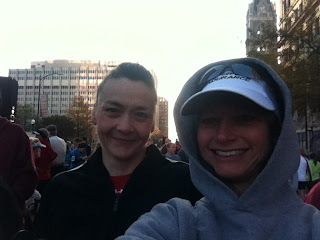 It's funny seeing folks in the hotel the morning after a marathon; it's easy to tell who raced! I fared pretty well with just some residual tightness in my calves and a bit of fatigue/soreness in the quads, hams, and glutes. (I've had way worse from leg workouts with Kurt.) I think I recover pretty quickly, maybe it's because I don't have time to think about it. Today was busy with traveling back home, unpacking, and doing all the laundry and various mom things for the week ahead. 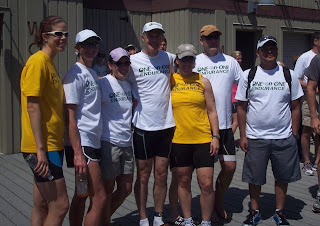 The race had a good outcome for me but that is never, EVER a given for me or for anyone. While I appreciate the confidence my family and friends have in me, I still have to fight hard for a good race just like anyone. When well-meaning friends say "I know you will do well," I am thinking, "well I don't know that!" It's not easy when there are expectations. I came into this race with some doubts and uncertainty given the limited training time and injury-inhibited running year. I was a bit scared as I knew that this race could potentially blow up for me. My energy waned through the week and I wondered what I'd have on race day. But I purposely don't give voice to my doubt as I believe that gives it power. If I say it, it makes it more real. I focus on what I can control and what I know to be true. 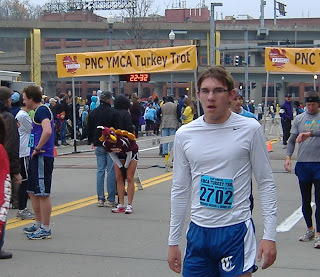 In hindsight, something that really helped was an idea I described in my pre-race post, this concept of running feeling like I was holding back. Whether I was or wasn't, I believed I was, and that helped me to feel strong and confident. 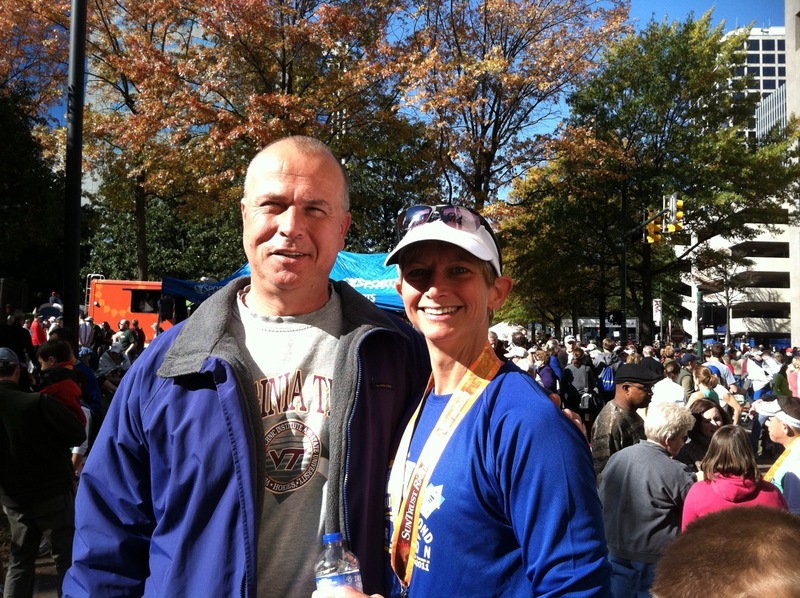 Coach and I had talked about me holding onto that feeling until mile 18, so that divided the race into two parts and the second part only had 8.2 miles! I really liked that approach. I am fascinated by the mental aspects of racing and all the tricks and methods we use to get the most out of ourselves. In summary, yes, I met my goal to run a disciplined and controlled race and to enjoy and be grateful for the ability and opportunity to do so. And yes, to finish #14 out of 268 in my age group with another comfortable BQ time was an added bonus. But I want folks to know that it didn't come easy, and that when we race, we wage war against doubt and fear! Isn't that part of the challenge? Incidentally, I got a few comments about my "immodium" mention in the previous post. That was a tip I picked up two years ago at the Richmond race while, ironically, waiting in line for the port-o-john. There was a recent sidebar write up about it in one of my running or triathlon magazines so I'm not the only one onto that secret. It's a good cure for a nervous stomach without any real negative side effects. Back to reality tomorrow....!! Have a great start to the week, everyone! 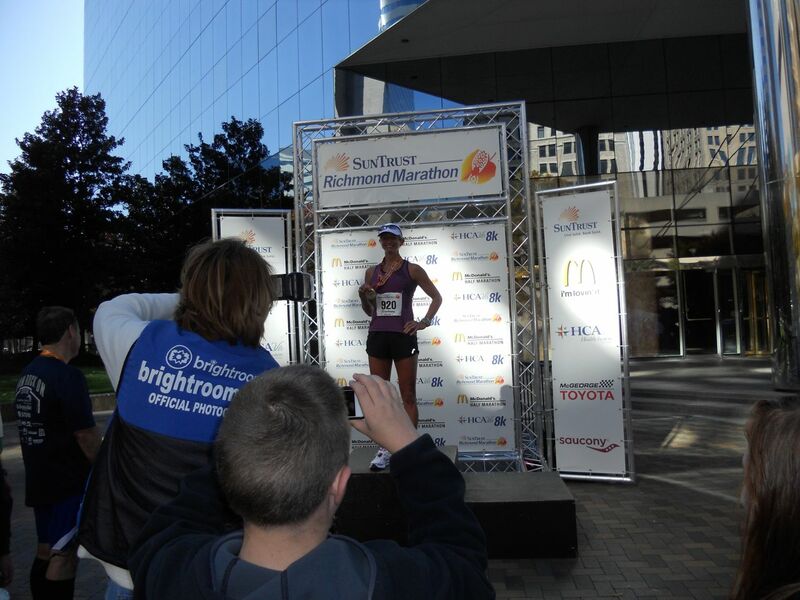 I"m pretty happy to be reporting from the OTHER side of the finish line! I've had a big lunch (with two beers...whoa), iced the legs, and am laying around while the boys and my husband are at the Science Center of Virginia. It was a 3:38:54 effort today (14th / 268 in Age Group) with nearly even splits (4 seconds off) for first vs second half so that is progress. 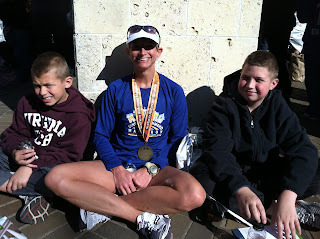 The funny thing is my other marathons were 3:38:39 and 3:38:01. I'm consistent, if nothing else! Considering my longest run this fall was 18 miles and I didn't really hit a "wall" till about mile 23 today, I am very very pleased. 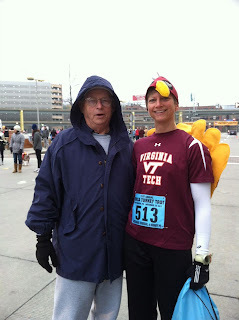 I asked Coach Jim to help me nail down a race strategy and we defined paces for the first three miles, set a governor or "speed limit" through mile 18 and had a range of paces to aim for. I like having specific goals for each mile, it keeps my brain occupied and happy. After mile 18 it was a little more open-ended. I nailed it through 18, then dipped from my 8:18ish pace to sub 8 at mile 19, then I think paid for that over-exuberance. Here are the details from Training Peaks if they are of interest. Race: carried 2nd Surge Accel Gels and a Cliff Bar cut into sixths and rolled into balls. Every 2.5 miles took bar, bar, gel. repeat! Took on water every 4 miles and one random coke. Walked briefly thru aid stations where I took water. 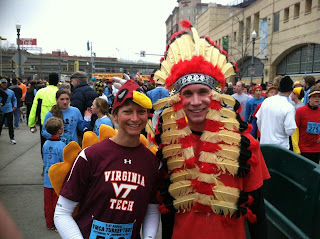 What amazed me was how some people dressed for this race. It was around 30 degrees when we walked downtown and I had four layers on top, a hood, gloves, and pants. I saw people waiting around shivering in shorts and tank tops! Such a waste of energy and not smart! I shed one shirt and pants (yes I had shorts on) and checked them in a bag at the start. I shed the $2 Goodwill sweatshirt right before the start, and the long sleeve shirt, arm sleeves, and gloves along the first 8 miles. I was VERY comfortable running in a tank and shorts. 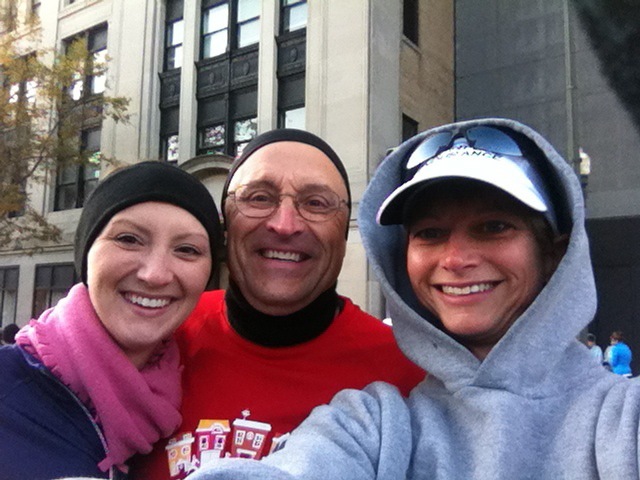 I saw people all bundled up in tights, long sleeves, and winter hats and could not imagine how burning up they were! I saw my family toward the start...then that was it till after the finish. I told them to have fun this morning and gave them a fully researched list of things to see and do (told you I'm a planner). This weekend is for all of us, not just me. When I finished...no family! I got my bag, called them up, and my husband whispered quietly that they were in the midst of a tour of the Capitol. Apparently it was an awesome tour and the kids said it was amazing. Who knew? It was just as well. I was miserable for about 30 minutes and my friend/running phenom Jordan helped get me situated till things settled down. I was fairly back to normal when they saw me. 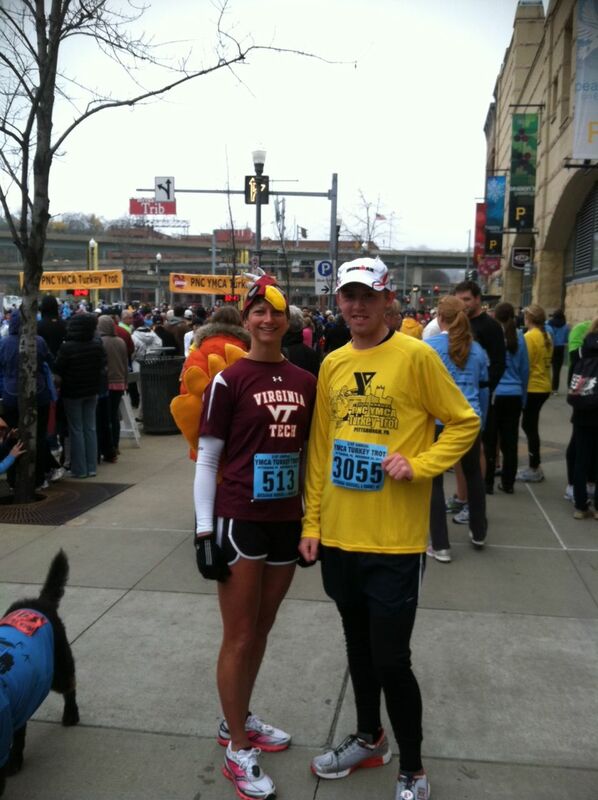 I'll tell you what, even at my worst today it never came close to the crampy horrible run at the Patriot's Half IM! I'm happy about the race plan, nutrition, and general mental approach to this race. In one of the last emails to Coach Jim I said something about "Discipline. Patience. Faith." He said that sounded like a good mantra. Indeed. I thought about that often today and I will carry that into the spring. 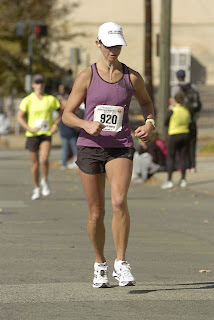 Next stop on the marathon circuit: Boston Marathon, April 16, 2012!! Thanks to Coach Jim, Kurt Weidner, my family, and the great community of triathletes and runners who make these sports so special!! 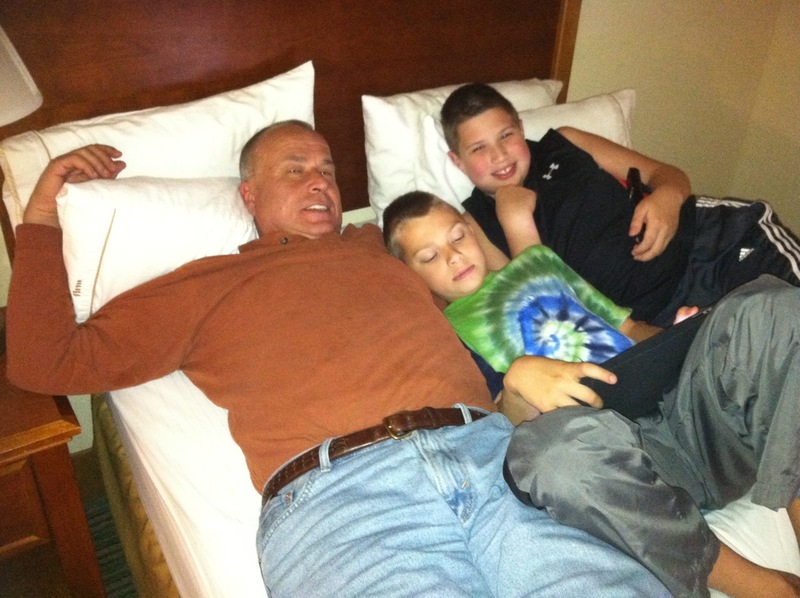 I'm also grateful to Dr. Tilley, John Thacker, and Mario Travis for keeping me as healthy as I can be. 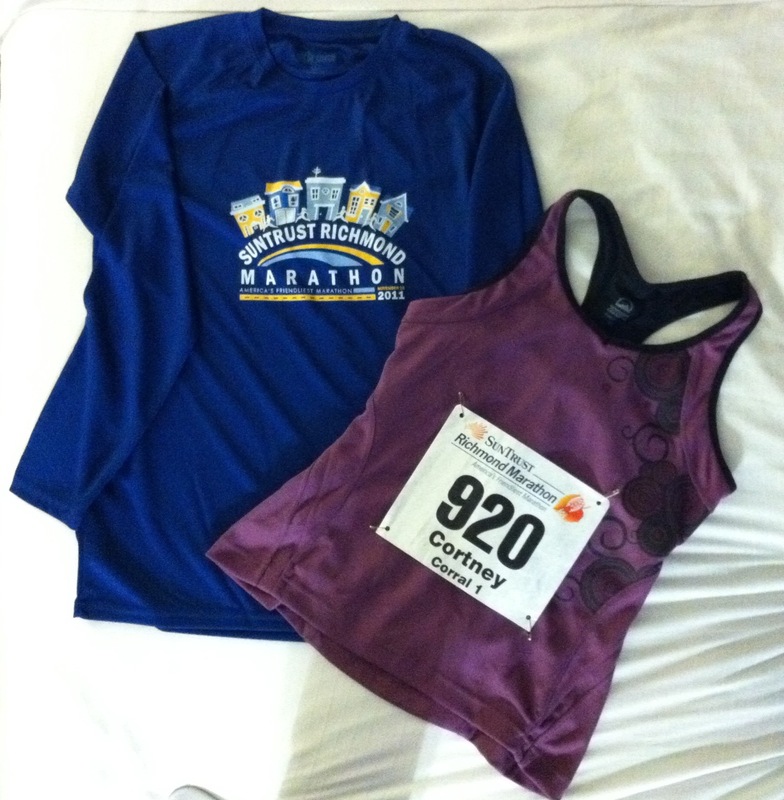 Marathons are celebrated with a new running tank....love this one! 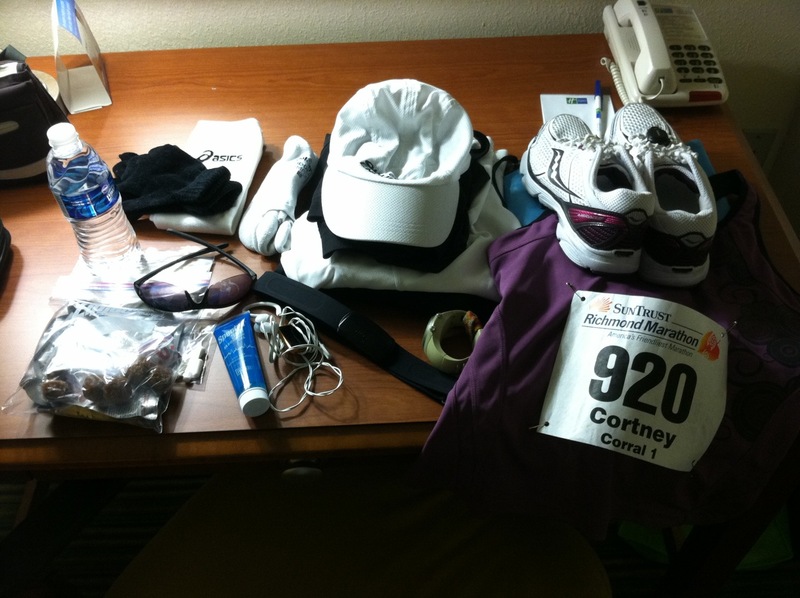 The OCD approach to getting ready for a race! My neighbor Joe and his daughter Blakely...and me looking so glamorous! 1. Lazy! My goal this week has been to get to bed early, sleep as much as possible, and to push morning workouts to the afternoon in lieu of more sleep. My incentive to hit the hay early is that's when I curl up to re-read Marshall Ulrich's book, Running on Empty, documenting his run across the US. 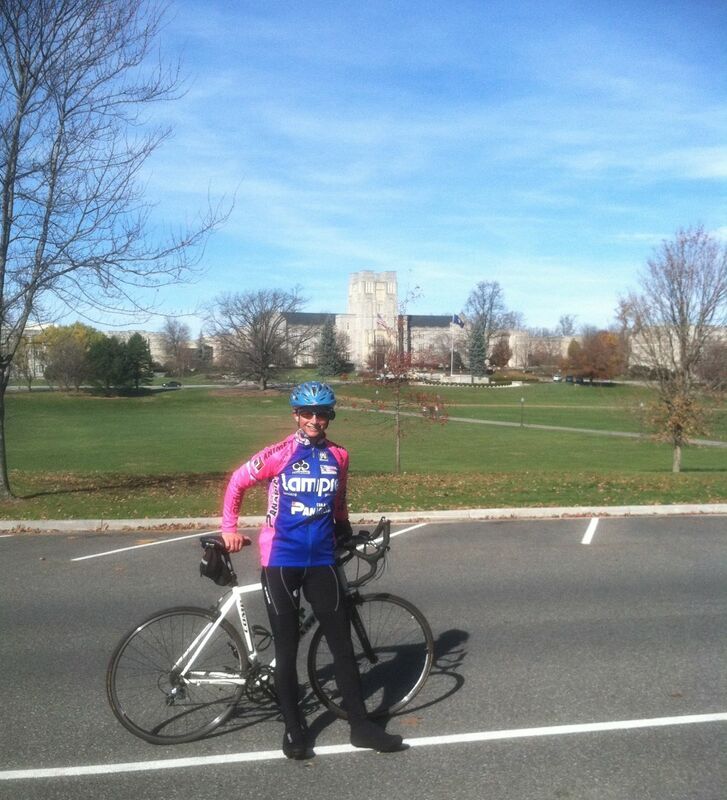 It puts a "mere" marathon into perspective as he was doing 60-70 miles a day on some beat-up legs at age 57. 2. Dialed into my capabilities. I've had enough runs of moderate to long distances to have dialed into my predicted marathon pace, which is in the ballpark of previous marathon paces. On Sunday's short MP run, I was super consistent and within 1-2 seconds on each mile. Of course, the stuff after mile 20 is still relatively unknown territory which is the fun and the mystery of it all. 3. Armed with a mental approach. My goal with this race is to demonstrate to myself and my coach that I have the discipline to hold back in the early miles and through the first half of the race. I had one really standout run this fall where I ran marathon pace for 14 miles then was asked to run two miles about 10-15s under marathon pace. I had this indescribable feeling of pent-up anticipation and found a whole extra gear, running the next mile 25 s under and the next mile I flew at 1:05 under (around my 10k pace), then settled easily back into MP. My incentive to hold back in the first half is the hope that I will get to experience even a tiny bit of THAT feeling again. 4. Sound. As opposed to "lame"....horse term. I generally feel pretty good from head to toe other than a slight shin splint on the left that doesn't seem to be a factor during the run but I sometimes feel it for a day after a run. 5. Like I live in a petri dish. Both kids were home sick Monday with respiratory infections. They sound like they are coughing up a lung especially at night. So I keep reminding them to cough away from me! It's hard not to think/imagine if my throat hurts, ears feel funny, etc. Am I really just lazy or do I have a touch of what they have? Ackkk!!! 6. Excited. I am coming into this race feeling pretty mentally fresh and not broken down. I really liked the training approach which included more frequent but not-as-long runs. That decision was a function of my injury history and short time frame to train. Marathon week can really play games with your head, but if there is one thing I have learned from the packed racing schedule this year, it's that you just have to go with the flow and have confidence that the body will know what to do on race day. 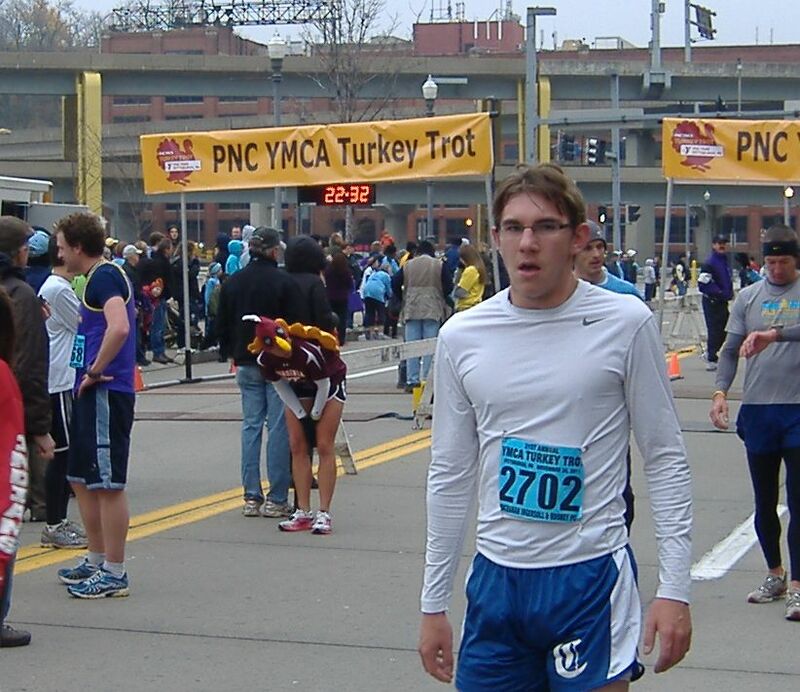 Due to the way the fall race schedule worked out, I am not as trained up for this race as I expect to be for Boston. So although a PR would be nice, my real goal is to run a disciplined and controlled race and to enjoy and be grateful for the ability and opportunity to get out there and do this. 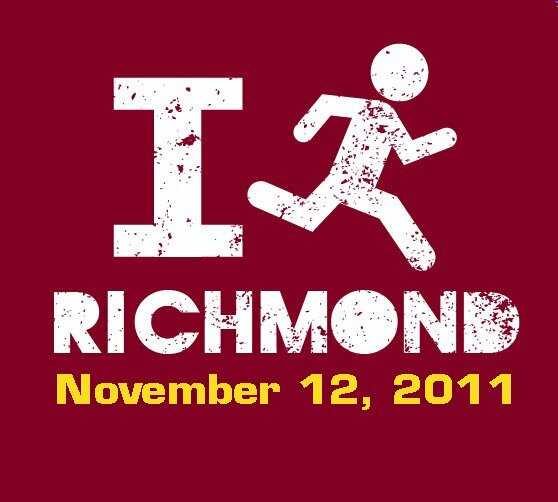 There are SO many people from my town running in Richmond, that's part of the fun of training for it. I'll be lining up with my two good friends, Carla and Michaela. 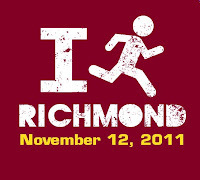 It's Carla's first marathon and I think the seventh Richmond Marathon for Michaela. 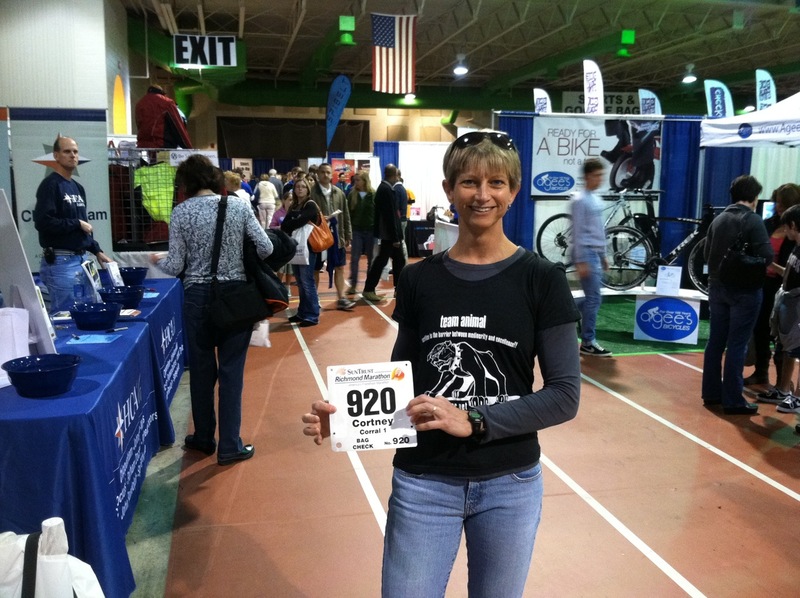 EFRT teammate Laura Bergmann will be there tearing it up too!! Six favorite things pictured here! It will be a lean Christmas around here, but no one really needs or wants much of anything. And honestly, what we define as "needs" are almost never truly "needs" but are instead, wants. We don't save up our happiness for gifts or vacations, but seek happiness each day. Or we try! So rather than a list of things I might want, I give you my UNChristmas list of ten treasured training related things that I already have. Note: this does not include favorite books, favorite DVDs, or most importantly, favorite people. Or my bikes! 1. Waterproof iPod shuffle - It's pricey, but after several failed waterproof cases this really is unmatched in swim tunes. I've had this for nearly a year with no issues, although it does rankle people to see you clip an iPod on your goggles and dive in! 2. 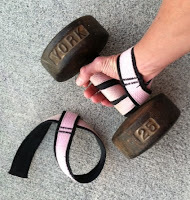 Asics arm sleeves - These are inexpensive, comfortable, versatile, and easy to wash. These are good for cool morning runs in the 30's or 40's or if I just need one more layer under a long sleeve top. Yes, I'm one of those who unapologetically sports the tank top and arm sleeve/glove look. 4. One-on-One running cap - it's a Headsweats brand hat, weighs nothing, and goes through the washer time and time again just fine. Plus it gives a shout-out to my great coach!! 5. Xtenex shoe laces- I'll never use anything else in my running or triathlon shoes. They are comfortable, stretchy, and require no adjustments after you get them in. My kids are big fans too. Who wants to waste valuable time tying shoes? 6. ISM saddle - I have the Road model on my road bike and the Race model on my tri bike. I discovered this unique brand when I worked a support station on a century ride and saw a girl come through with the ISM. She sang its praises and now I do too! 7. Three-year-old Adidas running gloves - This was the first running-related thing I ever bought so they have a lot of meaning for me. I've had to sew them up numerous times. 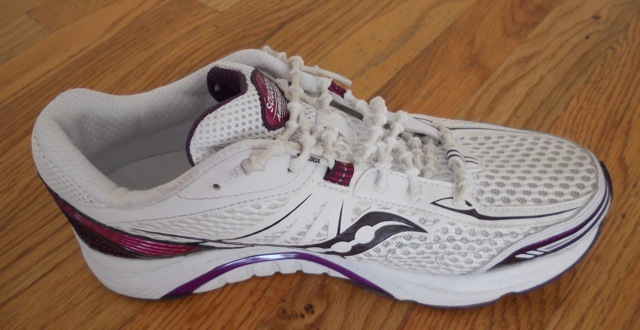 I don't wear them in races because I'm afraid to lose them! 8. 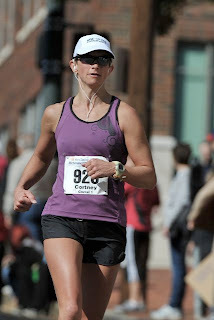 Garmin devices - I have the Edge 305 for the bike and Forerunner 405 for running along with the cadence sensor and foot pod. They are a few years old but still dependably deliver all kinds of data to delight this engineer. 9. 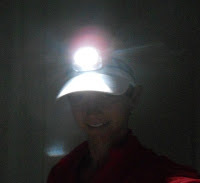 Petzl Tikka headlamp - This is what allows me to run before sunrise. I love the freedom it affords me, and it's lightweight and comfortable. I wear it over a running cap or winter hat to keep it from sliding. 10. Training Peaks - This is an unparalleled online system for workout scheduling, logging, and reporting. It provides easy communication to/from coach, excellent accountability, and great analysis for a numbers junkie like me. I don't consider a workout done until it's been uploaded and commented upon in Training Peaks! 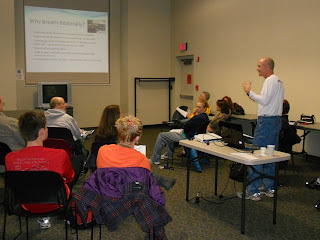 Today I met with Coach Jim to review the marathon plan and to do some preliminary planning for 2012. He had told me after my last triathlon to put it all aside until after the marathon but it's like when someone says not to think about elephants and you immediately think of an elephant. It didn't help when I'd listen to triathlon podcasts on long runs (here we go with podcasts again). I like plans. I had no plan. Then the Virginia Triathlon Series race calendar popped up. Now I felt behind! In November! So I put my thoughts to paper (Word file actually) and filled two whole pages (no surprise there) that I emailed to Coach to ponder. That helped to empty out my head until we could meet today. 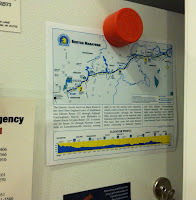 I had sections for the 2011 recap of positives and negatives, 2012 goals, potential races, and random thoughts. Ideas were scattered and unclear. 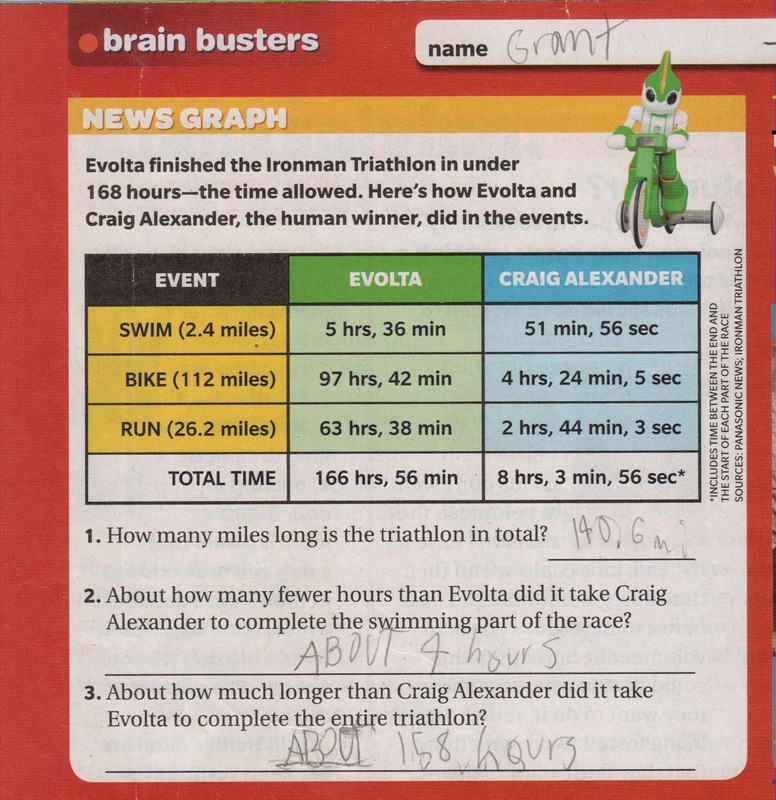 After some discussion and analysis of bar graphs and line graphs (best way to communicate with an engineer) we honed in on a plan for 2012 including a race calendar and training goals. I am filled with focus and purpose and rarin' to go!! Seriously. Excited. 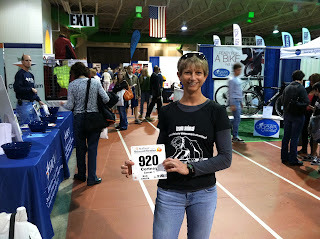 The 2012 race calendar is now on the blog sidebar. The foci are: Boston, Age Group Nationals, and Worlds. As much as I'd like to get redemption at the half-iron distance this season, jumping around distances is not ideal so I'll stick to sprints and Olympics and do mostly VTS races for my third season. 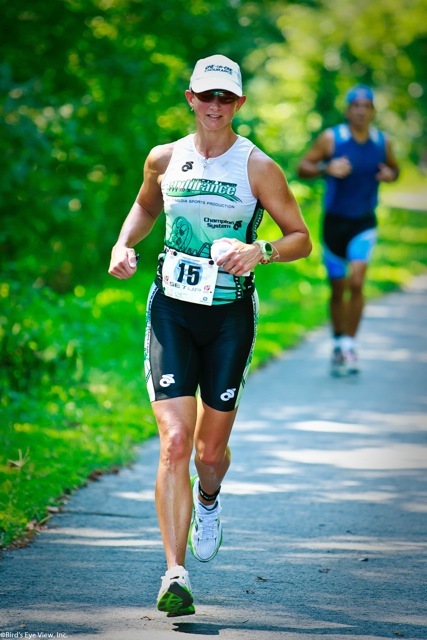 My job is to (1) stay healthy and on two feet and (2) continue to bring my best effort to workouts and races. I really want to see what I can do. Anyhow, I just wanted to sing the praises of my coach, and all great coaches, who bring order out of our chaos. After over 2-1/2 years with Coach Jim, he knows me very well, and in some ways perhaps better than I know myself. Coaches direct our efforts, hold us accountable, offer encouragement, reassure, and provide perspective. They raise the bar and challenge us but are there to remind us things don't always go according to plan. Coaches listen and can read between the lines to know what we need before we sometimes know. Anyone who thinks coaches simply "tell you what to do" has never had a great coach. To my coach (coaches, really since this goes for Kurt too), and coaches everywhere, THANKS!! !